Research@StAndrews blog: Sulfate on the early Earth – how low was low? Sulfate on the early Earth – how low was low? Findings recently published in Science (“Sulfate was a trace constituent of Archean seawater”, DOI: 10.1126/science.1258966) suggest that sulfate – a key biological nutrient – could have been incredibly scarce in the Earth’s ancient oceans. Sulfur is a crucial component of biomass and an important source of energy for microbial metabolisms. It also plays a central role in regulating atmospheric chemistry and global climate over geologic timescales. 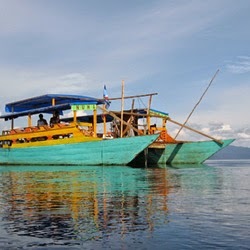 Research vessel on Lake Matano, Indonesia. PHOTO by Sean Crowe, University of British Columbia. Researchers led by Dr Sean Crowe, a lead author of the study in the Departments of Microbiology and Immunology, and Earth, Ocean and Atmospheric Sciences at the University of British Columbia, collected samples from Lake Matano, Indonesia—a sulfate-poor modern analogue for the Earth’s Archean oceans – to examine the isotope effects associated with sulfur metabolisms under early Earth conditions. The team used state-of-the-art mass spectrometric approaches developed at California Institute of Technology to demonstrate that microorganisms in this lake fractionate sulfur isotopes at concentrations orders of magnitude lower than previously recognized. “These results suggest that sulfate levels in the Archean could have been thousands of times lower than today, which would have had important consequences for the cycling of sulfur in the oceans and atmosphere, and for the evolution of early microbial ecosystems”, says Dr Aubrey Zerkle, a Lecturer in the Department of Earth & Environmental Sciences and collaborator on the study. Two additional papers published in the same issue of Science used similar techniques to examine sulfur isotope signatures of in ancient sediments from ~2.5 billion years ago. These studies suggest dynamic spatial and temporal variations of seawater sulfate during that time, supporting a low-sulfate scenario. However, both indicate that microbial ecosystems based on sulfur cycling still thrived, despite the lack of sulfate.